Looking to freshen up your summer with a cool and new-look sneaker? If you are, then Jordan Brand might give what you are looking for with the release of the new Jordan Alpha Trunner Max, which is set to make its debut in the market today! 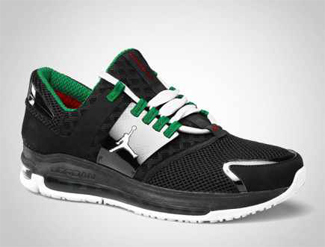 The Jordan Alpha Trunner Max will hit the market anytime today and it will be available in Black/White – Classic Green – Varsity Red colourway, an appealing one that is suited for its much-anticipated debut. This new shoes from JB features a full-length Max Air cushioning, which was incorporated in a Trunner for the first time. With its sleek design and impressive features, expect this new Alpha Trunner Max to be a huge hit in the market starting today! So what are you waiting for? Grab one now and you will surely love it!